Quetzaltenango, the second-largest city in Guatemala, is known as the 'City of the Soul of Culture' for its love of all kinds of music and art. Artists and musicians throng the city and are amongst the major tourist draws making Quetzaltenango one of the most popular destinations in Guatemala. Set in a verdant valley, the city is an important cultural centre with many activities taking place all year round. To its residents, the city is known as Xela, its ancient Maya name. Home to just over 160,000 people, Quetzaltenango's population is mainly Amerindian, with 35 percent Latino and a small percentage of Westerners who've decided to make this fascinating city their home. The city's historical centre conserves an assortment of architectural styles showing its rich colonial heritage, ranging from classical to Italian renaissance and clearly displayed in its palaces and grand buildings. The heart of Quetzaltenango is its rectangular-shaped Central America Park, known locally as just the Parque Centro (or more formerly as the Parque Centro America) and home to many cultural events and entertainment options, including a monthly handicraft fair. Local tourist information can be found at the Guatemalan Tourism Institute (INGUAT) outlet at the southern end of the Parque Centro America. Further tourist information, maps and brochures, including the popular 'Xelamap', can simply be picked up at the front desk of any decent hotel. The old colonial town is where the sightseeing in Quetzaltenango is at its best and this part of the city is named the Xela Historic Centre. With cobblestone streets, painted houses, colonial buildings and an interesting background, the Xela Historic Centre dates back to the 16th century, when it was constructed over an ancient Maya town. The majestic neo-classical Municipal Theatre (Teatro Municipal) is a good bet for live entertainment and many performances are staged here all through the year. Just a stroll away is the Rome Theatre (Teatro Roma), where further plays and concerts take place. Sightseers may also like to check out the Town Hall (Municipalidad), located on the north-eastern side of the Parque Centro America. Alternatively, take a walk through the charming Enrique Passage (Pasaje Enriquez), or admire the architecture of the House of Culture (Casa de la Cultura), which was built over the Espiritu Santo Church's cemetery and originally functioned as both a warehouse and prison. Families choosing to holiday in Quetzaltenango may like to spend some time at the Minerva Zoo (Parque Zoologico Minerva), roughly a 30-minute walk from the park and located on the Avenida Las Americas, where it comes with a reasonable mixture of exotic creatures and birds of prey, as well as a play area with a number of funfair rides. More information about Quetzaltenango Tourist Attractions. The architectural styles present in Quetzaltenango are eclectic to say the least, with the Spanish playing a big part in the city's appearance and layout. When the Germans arrived, the buildings took on an altogether more Gothic feel and this character is still very much visible today. Some of the most obvious landmarks include the Cathedral of the Sacred Spirit (Catedral del Espiritu Sagrado), which looks at its most spectacular when illuminated at night. Inspired by classical Greek temples, construction of the Temple of Minerva (Templo de Minerva) began in the early part of the 20th century and lasted almost 60 years, with its initial ancient appearance being quite deceiving. Other noteworthy landmarks around Quetzaltenango include the small hillside national park named the Cerro El Baul, the various medicinal hot springs spread around the city, and the Venetian-style Bridge of Los Chocoyos, originally built to enable locals to cross a road that once flooded on a regular basis. Excursions to the surrounding Highland Mayan villages and towns are highly recommended, with Almolonga being especially near and welcoming to tourists. More information about Quetzaltenango Landmarks and Monuments. The museum scene in Quetzaltenango may be far from extensive, although what is here is more than adequate. Situated within the Casa de la Cultura, the Natural History Museum (Museo de Historia Natural) comprises dinosaur fossils, stuffed animals, traditional Maya pottery and information about the 1871 Liberal Revolution - truly a diverse mixture of exhibits. Also set in the Casa de la Cultura is the Marimba Museum (Museo de la Marimba), dedicated to the Liberal Revolution and its simple aim to improve local trading by way of improved industry and new crops. At the Railroad Museum (Museo del Ferrocarril de los Altos), visitors will be able to learn about the commercial failure of the regions inter-urban electric railway, which once connected the Pacific Coast for less than three years, before storm damage ended its life prematurely. Right next-door is the Quetzaltenango Art Museum (Museo de Arte) and its 200+ paintings, including many masterpieces created by leading Guatemalan artists of their time. More information about Quetzaltenango Museums and Quetzaltenango Art Galleries. Quetzaltenango serves as a particularly useful and well-placed base to explore the Western Highlands, with an array of countryside hiking trails being especially close by and including treks to the very top of the Tajumulco Volcano (Volcan Tajumulco). This volcano is actually the highest point in the whole of Central America and the views from its summit are understandably superb. Also within comfortable reach of the city is the Santa Maria Volcano (Volcan Santiaguito), which is still active and forms a dramatic backdrop to the city. Three-day hikes to Lake Atitlan (Lago de Atitlán) are also possible, if you have the time and energy. Just a short drive from Quetzaltenango is the characterful market town of Zunil, established in the early 16th century and set alongside the River Salama. The hot springs of Los Fuentes Georginas also make for a popular excursion, as do the beautiful churches within the neighbouring towns of Salcaja and San Andres Xecul. At around 20 minutes to the west, the Laguna de Chicabal crater lake boasts emerald green waters and a strong place in the heart of the Maya people. The Friday market held at San Francisco El Alto has become quite the tourist magnet, with Momostenango drawing those fascinated by the Mayans, where its Maya Mission of Takiliben May Wajshakib Batz provides a real insight into their civilisation. Further afield, although really too far for a day trip, are the cities of Antigua and Guatemala City, the capital. 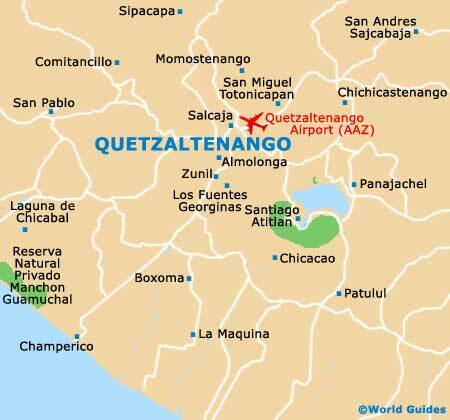 More information about Quetzaltenango Attractions Nearby.